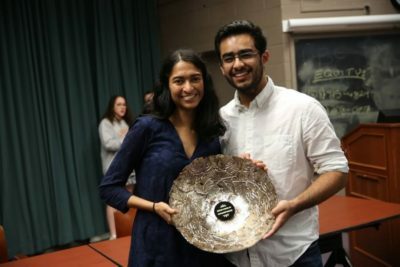 The HWS IV 2018 was won by Harvard DP (Tejal Patwardhan, Aditya Dhar) from Opening Government. They debated the final on the motion “This House believes that the state should curb assortative mating” against Yale CP (Ko Lyn Cheang, Lorenzo Pinasco) in Opening Opposition, Brandeis/Northeastern SS (Ravi Simon, Dennis Su) in Closing Government, and Rochester FO (Ben Frazer, Warish Orko) in Closing Opposition. The final was chaired by Buzz Klinger with Alexander Beaumont, Allie McGowan, Dan Yoon, Daniel Berman, Shani Bennett, and Steph White. The Novice Final of the tournament was won by Cornell CJ (Carson Crane, Amaar Jeyasothy) in Opening Opposition, on the motion “This House would allow the creation of Savior Siblings.” They debated against Harvard HR (Maya Razmi, Delaney Hurley) in Opening Government, Hart House AN (Matt Aydin, Jonathan Nahmiach) in Closing Government, and Patrick Henry BW (Gabe Blacklock, Hannah Westfallen) in Closing Opposition. The round was chaired by Daniel Berman with bexley brown, Nathaniel Carlsen, Graeme McGuire, Jan Hovden, and Emily Saeli in the panel. The best speaker with an average of 82.67 was Aditya Dhar from Harvard DP. Harvard DP was the top seed and Aditya and Tejal were the top two speakers of the tournament. The best novice speaker with an average of 80.5 was Hemanth Bharatha Chakravarthy from Harvard BH. The CA team consisted of Dan Lahav, Stephanie White, Ameera Moore, and Fanele Mashwama. The tournament was organized by the HWS Debate Team. Chuan-Zheng Lee was in tab with Eric Barnes.